Periodontal Disease, also known as periodontitis or gum disease, is a progressive disease which affects the supporting and surrounding tissue of the gums, as well as the underlying jawbone. If left untreated, periodontal disease can result in loose, unstable teeth, and even tooth loss. 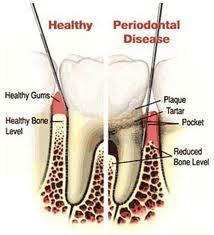 Periodontal disease is the leading cause of tooth loss in adults in the developed world. Periodontal disease begins when toxins found in plaque start to attack the soft, or gingival, tissue surrounding the teeth. Clusters of bacteria become embedded in the gum and rapidly breed, causing a bacterial infection. As the infection progresses, it starts to burrow deeper into the tissue causing inflammation and irritation between the teeth and gums. The response of the body is to destroy the infected tissue, which is why the gums appear to recede. The resulting pockets between the teeth deepen and if no treatment is sought, the bone surrounding the teeth will begin to progressively recede. The result of this process will often be unstable teeth and even tooth loss. Periodontal disease is preceded by gingivitis, which is a bacterial infection of the gum tissue only. A bacterial infection will affect the gums when the toxins contained in plaque begin to irritate and inflame the gum tissues. Once this bacterial infection colonizes in the gum pockets between the teeth, it becomes much more difficult to remove and treat. If gingivitis is not treated properly, periodontal disease will follow. This can result in the eventual destruction of the connective tissue and jawbone.